WHAT ARE THE BEST ONLINE MASTER'S IN SOFTWARE ENGINEERING PROGRAMS? What Else can I Expect from an Online Master's in Software Engineering Program? Software engineers work with computers, they write the code, design the algorithms, and make sure that programs meet the requirements of businesses and society. Software is used for finance, healthcare, gaming, entertainment, and more. Software engineers are important because many people need someone who can develop, maintain, and fix applications. As technology improves and becomes more sophisticated, the demand for software engineers is going to grow. The Bureau of Labor Statistics predicts that jobs for software developers will grow by almost 20% from 2014-2024. This will provide many opportunities for graduates with a master's in software engineering. Most online master's in software engineering programs are designed for people with an undergraduate degree in computer science, engineering, information technology, or a related field. Some will admit students without a computer degree if they have a programming background. Work experience in the field can help with that, but it's not usually necessary. To find the right program, it's important to ask yourself a few questions. Would you rather attend a tech school, a large public university, or a small liberal arts college? Do you desire a big class and a lot of personal interaction? Would you prefer a part-time program or one that requires a full-time commitment? Do you intend to work while you earn your degree? Your answer to these questions will help determine what you need most out of a program. WHAT ARE THE ADVANTAGES TO EARNING MY SOFTWARE ENGINEERING DEGREE ONLINE? One of the advantages of earning a master's in software engineering online is that it allows you to continue working full time. Many programs are asynchronous, allowing you to complete work on your own schedule. Most programs require you to log on a few times a week. A synchronous program requires you to log on at specific times, and this is commonly done in the evening to provide flexibility. Harvard's master's of liberal arts in software engineering degree is designed for students with a background in programming and discrete mathematics. This online software engineering master's program offers the options of a thesis track, which requires nine courses and an independent thesis, or a capstone track, which requires 11 courses and a team capstone project. Students are required to take at least one class on the Harvard campus; on-campus term lengths range from three weeks to a full semester. For those interested in focusing their degree, students can take electives to earn a graduate certificate in data science, web technologies, or cybersecurity. Applications are accepted in the fall, spring, and summer terms. To apply, prospective students must complete three admission courses with a grade of B or higher and pass an online test of critical reading and writing skills. To graduate, students must maintain a 3.0 GPA and complete their degree requirements within five years. Located in Pittsburgh, Pennsylvania, Carnegie Mellon offers a master's of software engineering degree. This online master's degree in software engineering can be completed as a full-time student in 16 months, or as a part-time student on a flexible, multi-year plan. For full-time students, the program begins in the fall semester and concludes the following year in December, for a total of three semesters and one intensive summer session. The degree is designed for practicing software developers who have at least two years of professional experience. Students work in teams on real-world projects for industry clients like Google, Intel, and General Motors. For those interested in pursuing more in-depth study in a particular area, students can design a maximum of two independent study courses, which fulfill a portion of the elective requirements. Students also complete units in core, project, and communication courses. At this time, residents of Alabama, Arkansas, and Minnesota are not eligible for enrollment in this online program. Established in 1940, the Illinois Institute of Technology offers an online master of telecommunications and software engineering. Administered jointly by the Department of Electrical and Computer Engineering and Department of Computer Science, this 30-credit degree takes 18 months to complete. Courses in the program include software systems architectures and communication engineering fundamentals. Students may choose from electives in telecommunications, software engineering, and telecommunications systems. This degree does not require a thesis or a capstone project. Learners applying to IIT's online software engineering master's degree should hold a bachelor's degree in electrical engineering, computer engineering, or computer science. The school considers other applicants, but it typically requires them to take leveling courses. As part of the admission process, applicants must submit GRE scores that meet or exceed IIT's required minimum. Established in 1880 as a private institution in Los Angeles, the University of Southern California offers a 32-credit online master of science in computer science with an emphasis in software engineering. The degree takes full-time students between 18 months and two years to complete. Coursework includes 12 credits of required courses, 11-12 credits of core courses in software engineering, and 3-4 credits in software engineering electives. Course options include software management and economics, foundations of artificial intelligence, and brain theory and AI. All students must complete an analysis of algorithms and may take a directed research course. Graduates of USC's online master's degree in software engineering can enter fields such as bioinformatics, computer security, aerospace, and defense. Applicants to USC's program must hold a bachelor's degree in engineering, math, or hard science with an acceptable GPA from a regionally accredited university. Prospective students also need to submit satisfactory GRE scores and show a substantial background in computing. Once admitted, students must maintain a 3.0 GPA or above to graduate. Designed for software industry professionals, CSU-Fullerton's online master's of science in software engineering is a cohort-based program that students generally finish in 22 months of year-round classes, taking two courses each semester. The program requires students to complete a total of 10 courses, or 30 credits, including a capstone project. Additional requirements include an orientation seminar and a midpoint symposium; students who cannot attend these events in person can participate online. Courses are delivered through TITANium, which is a Moodle platform. This software engineering online master's program admits new students only in the fall. Applicants with a bachelor’s degree in computer science should have a minimum GPA of 2.5. Prospective students with a minimum one year of working experience in the software industry may be considered even without a bachelor’s in the field. Support for distance learners includes variety of learning and communication tools. SIT's master’s in software engineering, delivered through its School of Systems and Enterprises (SSE), offers two tracks: an advanced program for students with computer technology knowledge, or a bridge program for students with little computing background. The advanced program requires students to complete eight courses and two electives, while the bridge program requires students to complete 10 courses, a summer bridge program, a recommended second summer internship, and a part-time option for the final two courses. Liberal arts graduates with a strong academic record who apply for this program are eligible for the $5,000 per semester scholarship grant SIT provides through its partnership with the National Science Foundation. The program's curriculum, delivered through the Canvas Learning Management System (LMS), focuses on real-world problems and is taught by faculty with substantial industry experience. Top hiring firms for this master's in software engineering online degree include AT&T, Cisco, Lockheed Martin, and Verizon. Applicants to full-time graduate programs in SIT's SSE are required to submit minimum GRE scores. Students have six years to complete their degree. UHCL's master's of science in software engineering program was one of the first software engineering programs founded in the U.S., and the university has been awarding degrees in the subject for over 20 years. In this master's in software engineering, students must fulfill the same program requirements and pay the same tuition whether they complete the program on campus or online through the Blackboard LMS. Online student resources include academic advising, career services, counseling, as well as student success centers. The degree requires students to complete 36 credits; online software engineering master's students are required to complete a three-credit capstone project along with 15 credits of core requirements and 18 elective credits. Once accepted to the program, students must file a candidate plan of enrollment in the first semester that indicates the courses they plan to take. Students from the District of Columbia, Pennsylvania, Puerto Rico, and Wisconsin are not currently eligible to take online programs at UHCL. Located in Greenville, North Carolina, ECU offers a master's of science in software engineering (MSSE) degree both online and on campus. The program provides a shared experience between online and on-campus students, incorporating the strengths of both populations. Students choose from three concentrations: software design and development, software project management and quality assurance, or software testing. Concentration courses comprise 12 of the 30 credits students must complete to earn their degree. MSSE applications are considered for fall, spring, or summer terms. While minimum GRE or MAT scores are required of most applicants, those with over 10 years of experience in the field may have this requirement waived. Online courses are generally taught using an LMS like Blackboard or Centra. Student resources include a career center, online library, and an online writing lab. Elective options in this master's in software engineering online include courses such as developing e-commerce systems and artificial intelligence. Drexel has delivered online programs since 1996 and provides online students access to the university's library, writing center, career center, and 24/7 tech support. The school's master's of science in software engineering has two track options: computer science or information science and technology. Each track requires 45 quarter credits, which is equivalent to 30 semester credits. Drexel's academic year is divided into four 10-week quarters, allowing students to take more courses in a shorter amount of time. Of the required quarter credits in this program, 18 are in core courses and 27 credits are focused in the specific tracks. Applicants to this online software engineering master's are required to have a minimum cumulative GPA of 3.0 for the last two years of undergraduate work. If applicants have less than a 3.0 GPA overall, they will need to submit scores from the General Aptitude Test of the GRE. Students from Wisconsin are not currently eligible to enroll in this online program. Located in the Phoenix metropolitan area, Arizona State University graduates more than 20,000 students every year. Among its 450+ academic options for graduate students is a 30-credit online master of science in engineering in software engineering. Most of the program's 10 courses take 15 weeks to complete, but the university offers some classes in a 7.5-week format. Once enrolled at ASU, students take nine core credits, three concentration credits, and 15-18 restricted electives. Learners have the option to top off their program with a portfolio or an applied project. Courses at ASU include information assurance and security, software project, process and quality management, and software engineering principles and concepts. Successful applicants to this software engineering online master's degree must have completed a bachelor's or master's degree in a relevant field, such as computer engineering or software engineering. The school expects students to have earned a minimum GPA of 3.0 in the last 60 credits of an undergraduate degree or in the last 12 credits of a post-baccalaureate program. Students in Mercer University's online master's of science in software engineering focus on techniques for defining, analyzing, and solving complex problems. Applicants to the program are expected to have an undergraduate degree in engineering and the ability to perform multimodule programming in a modern high-order language. Students who submit all application materials by the priority application deadline receive an admission decision within two weeks. Located in Macon, Georgia, Mercer's School of Engineering celebrated its 25th anniversary in 2010 and enrolls approximately 700 students annually. A few of the top 20 companies that hire Mercer engineering graduates include Lucent Technologies, Boeing, and Gulfstream Aerospace. This online master's in software engineering degree is 100% online and classes are asynchronous. To graduate, students must complete 30 credits and can choose to complete a thesis, which requires both a research project and a written component. TTU's online master's of science in software engineering allows students to begin the program at any time during the year and does not require students to take a certain number of courses each term. In addition to three letters of recommendation and a statement of purpose, applicants are required to submit GRE scores. Students who do not have a bachelor’s degree in computer science or its equivalent may be required to take additional courses. TTU online courses are asynchronous and use the Blackboard LMS. For any technical issues, students have access to a 24/7 phone and online chat help desk. 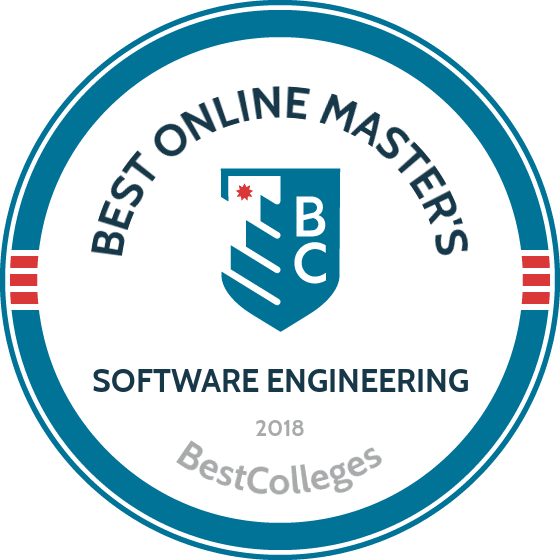 The master's in software engineering online program does not require a thesis, but students must complete 12 courses, or 36 credits, and pass a written exam in order to graduate. With only three core courses, students choose nine electives from a variety of software engineering and computer science courses. Founded in 1959, the University of Michigan's Dearborn campus hosts 9,000 students studying in more than 140 undergraduate and graduate programs. Among these programs is UMD's 30-credit, interdisciplinary online master of science in software engineering. Once enrolled, students take courses in areas such as software engineering, embedded systems, and advanced software techniques in engineering applications. Learners' elective choices include the semantic web, intelligence systems, and advanced artificial intelligence. Either a project or a thesis concludes the program. To graduate, students need a cumulative "B" average in their coursework. To be eligible for admission, students must hold an undergraduate degree in computer science or computer engineering and have at least a "B" average. Students with a lower GPA can indicate preparation for the program through high standardized test scores or an extensive practical background in the field. A series of pre-requisite courses including calculus and at least one programming language rounds out the admission requirements for the online master's in software engineering. West Virginia University has served the public since its founding in 1862. Located in Morgantown, Virginia, WVU is home to more than 31,000 students who can select from hundreds of majors and graduate programs including a 33-credit online master of science in software engineering. Courses in the program include software project management, software evolution, and introduction to object-oriented design. Students may also choose an experiential learning course as well as six electives. Courses require live discussions with the instructor and other students on select evenings during the week. Designed for working professionals, WVU's online master's in software engineering accepts students in the spring, summer, and fall terms. Admission requires a recent degree in computer science or a related field, but work experience in the field is not necessary. Applicants need a minimum GPA of 3.0 and a satisfactory GRE score for full admission. Both West Virginia residents and nonresidents pay the same tuition. The University of Alabama's Huntsville campus offers more than 90 graduate and undergraduate programs, including a 30-credit online master of science in software engineering. Based in the College of Engineering and the College of Science, the program offers a thesis-track and a non-thesis track. Students in both tracks complete required courses such as object-oriented design and analysis of algorithms. They can also select from five concentration options including parallel programming, embedded systems, and advanced cybersecurity. Unconditional admission to University of Alabama-Huntsville's master's in software engineering online requires a bachelor's degree from a BET- or CSAB-accredited program. Students must also meet a minimum GPA of 3.0 and have an acceptable GRE score. In addition, successful applicants need knowledge of software engineering basics such as computer architecture, discrete structures, and programming in C.
Online master's in software engineering programs are offered in full-time and part-time formats. Some programs focus on a particular area, including software architecture, game systems, entrepreneurship, and health care. Others might combine a master's in software engineering with an MBA. Students can also find broad programs that cover many aspects of the field. While programs differ, most have similar curriculums. Whether or not a student has chosen a specialization can affect the curriculum, but the courses listed below are common among many programs. Software Development in C++: C++ is one of the most common programming languages used, and the more fluent programmers are the more effective they'll be using it to design new applications. This course examines how C++ is used to create the building blocks of software. Web Development: This class explores the use of programming in web design and development. It looks at the way we use the internet and how writing code can shape its future. Software Architecture: Students learn how programs are put together and when to use what type of programming. Software architecture teaches students how to select and use appropriate software design patterns. Web Security and Privacy: This class teaches the latest techniques in cybersecurity. Students learn how to effectively defend themselves and companies from attacks. HOW LONG DOES IT TAKE TO GET AN ONLINE MASTER'S IN SOFTWARE ENGINEERING? The time it takes to earn an online master's in software engineering differs between programs. Most online master's in software engineering programs require 36-38 credits, which take about two years for full-time students to earn; part-time students will take about three to four years. Some programs are offered in an accelerated, six or eight-week term, format. Others are asynchronous and individually paced, meaning that students move at their own speed. Cohort-based programs group students into teams that progress through the program at the same pace. Other factors that affect the length of a program are concentrations, double majors, and extra certifications. Course availability is also an issue; some small schools might only offer required courses once a year. Make sure the program you enroll in accredited by a legitimate credentialing agency. Accreditation ensures that the online master's in software engineering program meets certain standards and is widely accepted. There are many accrediting organizations at the national and regional levels. Most of the nation's better schools are regionally accredited by organizations like the New England Association of Colleges and Schools or the Southern Commission on Colleges and Schools. National organizations, like the Accrediting Commission of Career Schools and Colleges, tend to accredit programs and schools of a certain type, such as vocational or technical schools. It's common for agencies to accredit specific disciplines as well. The best software master's programs online are accredited by the Accreditation Board for Engineering and Technology (ABET). The Department of Education (DOE) provides oversight on accreditation, reviewing and renewing accrediting agencies and providing students with a database of information. The DOE is assisted in this role by the Council for Higher Education Accreditation (CHEA), which is a national advocacy organization that represents 3,000 member colleges and universities. The council serves as an accrediting watchdog. CHEA does research, studies issues affecting accreditation, and makes recommendations to the DOE to ensure that accrediting standards are upheld. A list of accredited schools is available through the DOE and the CHEA. Software engineers are in demand in fields beyond technology. Graduates are prepared for work in the government, air and space, biomedicine, communications, high finance, mobile computing, and film and TV. Software engineers graduate with project management, critical-thinking, and problem-solving skills, in addition to their programming expertise. This skillset enables some students to start their own business. 1. Software Developer: Software developers write and maintain the applications that are used every day in business and popular culture. Some work for massive conglomerates and Fortune 500 companies. 2. Computer Programmer: Computer programmers make sure applications work with the computers they were designed for. They spend a lot of their time writing code and engineering systems. 3. Computer and Information Research Scientists: Computer and information research scientists find solutions to problems in technology and innovate and create new uses for software and computing. 4. Biomedical Engineer: Biomedical engineers work with technology in a healthcare setting, designing the future of medicine. This career demands innovation. Many graduates help design artificial organs and maintain biomedical equipment. 5. Game Engineer: Workers will spend much of their time developing code bases for video games and development tools. They work in the video game industry with artists and story developers to create the next big game systems. A master's degree in software engineering is usually enough for most employers, but certification can lead to higher earnings and more opportunities. Adding a certificate in cybersecurity from (ISC)2 or a software developer master certification from the IEEE Computer Society would enhance the profile of any engineer. Software Developer Master Certification: Sponsored by the IEEE Computer Society, this certificate is proof of the highest level of achievement in software engineering. It requires graduates to pass a 180 minute exam and two three-hour applied coding exams. Certified Information Systems Security Professional (CISSP): The CISSP is becoming the industry standard for cybersecurity certification. The exam tests competency in eight fields, including secure software development. Proprietary Certification: Many of the large tech companies, like Microsoft and Amazon, have certification programs for their own software. Microsoft Technology Associate Developer certification includes software development with mobile applications and gaming. A 2015 study by Georgetown University has shown that starting salaries for programmers with a master's degree can be as much as $17,000 higher than those with an undergraduate degree. At that rate, a master's can pay for itself in no time. Many employers are actively seeking software engineers with graduate diplomas. Graduates have many career opportunities, as software engineers are needed in most industries. Joining one of the major computer science professional organizations has many benefits, including continuing education, credentialing, networking, and career services. Many organizations host conferences where you can meet and share information with other software engineers, providing many opportunities to grow your knowledge. The AWC has a mission of advancing the future of women in professional computing. They encourage females to enter the STEM field. This is achieved through education, networking, and mentoring. The world's largest membership organization of computer professionals. The IEEE Computer Society has more than 60,000 members and sponsors over 200 annual technical conferences. They also publish 17 scholarly journals and 13 magazines. ACM also calls itself the world's largest educational and computing society. They publish many scholarly journals, host conferences, and provides members with career resources. Paying for an online master's in software engineering can be a challenge, but one of the bonuses of a web-based education is that it's often slightly less expensive than its brick-and-mortar alternative. Students can sometimes earn their degrees faster online and often benefit from in-state tuition, even when they live out of state. The same financial aid, scholarship, and work-study programs that on-campus students enjoy are available to distance learners. By completing the FAFSA form, students will learn about what's available to them through federal aid and how to obtain the funds. Students in the field of computer science can also find help from many tech companies. Google, Apple, and Xerox offer scholarships to female and minority students.